PP Mac was voted into this important office after having served as a Director in each of the Four Avenues of Service and as Vice-President for the preceding year, in addition to which, he had served as the Group II Representative to the District for three terms. With this experience PP Mac decided to canvass all the members of the club to ascertain their particular field of interest in serving on committees. As guidance to other Rotary presidents, PP Mac would like to advise that this approach was dismal failure and that the only effective means of achieving results is the personal approach to members with organizing ability if the project is to be a success. Notwithstanding the above setback, there were several notable achievements during his term of office. Article 5 of the By-Laws of the Rotary Club was amended to provide a student trust fund, the new amendment reading as follows. Section I: The admission fee shall be $25.00 to be paid before the applicant can quality as a member. An additional $10.00 shall be due to be paid to the Rotary Club Foundation. Furthermore, each new member shall be obligated to pay $10.00, which amount shall be deposited in a separated account to be established by the Treasurer to be known as the “Student Exchange Trust Fund”. The principal of said Fund shall not be depleted but interest accruing thereon may be spent for the purpose of student exchange activities according to the guidelines as may be established from time to time by the Board of Director. However, no funds shall be expended from the fund prior to the expiration of five (5) years from the date the Fund is established. “Our guest speaker last week was Rotary Ann Joanne Sullivan. Joann gave us a rundown on the plans that the Guam Blood Bank Association has. “These last couple of years has been somewhat of a change in the source of blood volunteers. Joann’s group has been working with the civilian population recording blood types and where they can be located. “Out of the 3,500 plus people they’ve contacted and recorded, only about 1,500 of them are good donors healthwise. Their goal is to have 10,000 people cataloged which would yield approximately 4,000 good healthy donors. 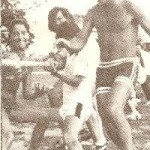 In accordance with the policy that ideas should be initiated by Rotarians and then handed over to other organizations if a continued need exists, is illustrated by this particular project, which is now operated by The Blood Exchange Center of Guam, as per the following article from the Pacific Daily News dated 24 September 1979. The Blood Exchange Center of Guam, in cooperation with the Rotary Club and the Guam Association of Life Underwriters, will sponsor an islandwide blood exchange drive. The drive, to be designated by gubernatorial proclamation as Sept. 24-Oct 24, will coincide with the Guam Blood Exchange Drive, according to Popoy Zamora, executive director. The drive will try to register types of all local residents and to recruit potential donors during emergencies. – Blood-typing campaign to be conducted in villages, supermarkets, shopping center, businesses and government offices. – A listing of employee blood types will be sent to individual offices for employees’ use during emergencies. – A mobile blood bank will visit all villages to encourage blood donations. The hospital does not have use of a regular blood freezer unit on-island that can store blood over 21 days, Zamora said. 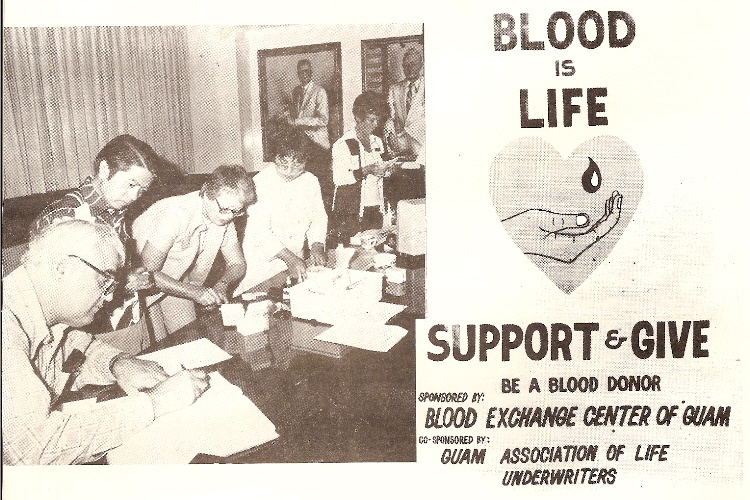 The Blood Exchange Center of Guam is non-profit local group organized in 1976 to improve problems of blood donations during emergencies. The Rotary Club had donated funds to the project and the Guam Association of Life Underwriters will help provide volunteers for the project. Roger Surban will act as chairman for the project. Persons interested in typing their blood may visit the Guam Memorial Hospital laboratory, the Department of Public Health and Social Services and the Blood Exchange Center, located in the old GMH building in the former GMH lab. Residents in southern villages may visit the Inarajan public health clinic. The effect of Districting and the improved understanding of Rotary ideals are borne out by the activities which took place during this Rotary year. 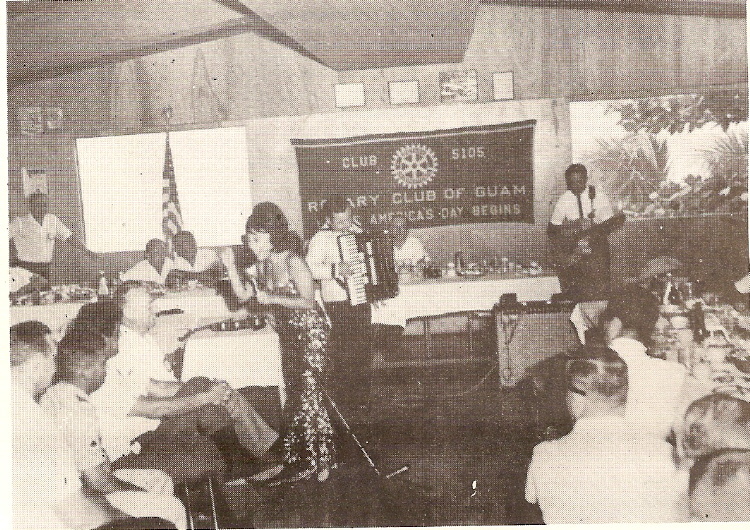 On 14 through 16 February 1978, sixteen Rotarians from Group 5, some with wives, visited the clubs in the Marianas to further fellowship between the various groups in the District. On 23 February 1978, members of the Suzu Rotaract Club came to this area, and under the guidance of Rtn. Al Sadhwani, were given a tour of the pints of interest and were entertained by the Guam Jaycees, and attended a meeting of the Rotary club of Guam. In March 1978, 120 students from the Karuizawa Sekai Seken Tomonokai came to Guam and were given the royal treatment by PP Jim Underwood. On 12 through 25 March 1978, two girls and three boys from the Sister Club at Karuizawa visited Guam, and on 22 through 25 March 1978, eight Rotarians and four of the wives from the Sister Club were entertained by the members of the Rotary Club of Guam. 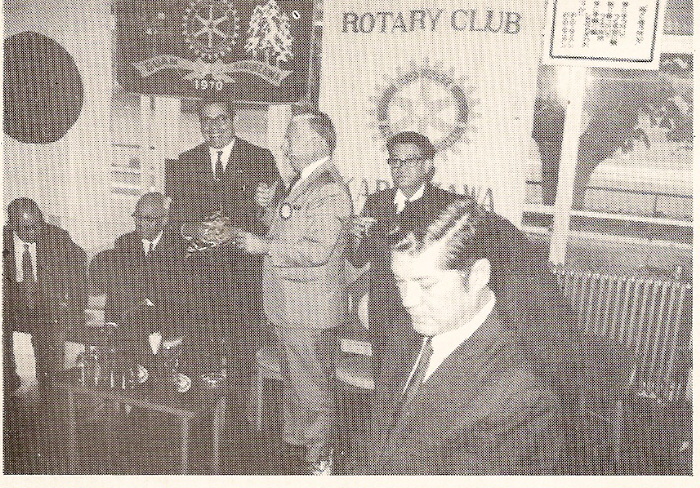 On 24 October 1977, I attended the regular meeting of the Karuizawa Rotary Club, President David Hoshino introduced me to Mr. Yasuharo Sato, who is Chairman of the Sister Club activities. Rtn. Sato advised that about 20 March 1978, approximately 20 members of the Karuizawa Club, 3 to 5 of whom will be accompanied by their wives, will visit Guam. During this time the student visit will also take place. It is anticipated that there will be 5 or 6 visiting student attending high school with an average age of about 17. Rtns. Hoshino and Sato asked that we again accommodate these students in private homes. It is anticipated that the students will stay for two weeks and that the Rotarians will stay 2 or 3 days. Some of the Rotarians have expressed an interest in playing golf while they are here, and some would like to go fishing, while others desire site seeing. The school holidays in Japan occur in March and the students are expected to leave Haneda Airport about 10 March 1978. The Karuizawa Club is very interested in maintaining the student exchange relationships and possibly the sponsorship of a student to attend the University of Guam in a similar manner to the arrangements which exist between the Tumon Bay Rotary Club and the Atami-South Rotary Club. The District Governor is also very interested in such an arrangement as they feel that this is of real value in promoting international understanding. The Karuizawa Rotary club has gone so far as to obtain approval from the Foreign Minister for setting up a student exchange foundation in the amount of 5,000,000 Yen, the interest from which is to be used for this purpose. The approval of the Foreign Ministry was granted 1 September 1977. I would be my recommendation that a large percentage of the proceeds of our Las Vegas Night be set aside for establishing a similar foundation for our club. Mr. Yasuharu Sato is the Executive Managing Director of the Mampei Hotel in Karuizawa and is very enthusiastic with respect to the Sister Club activities and I sincerely hope that our club will share some of that same enthusiasm. To show that the Rotary Club of Guam is not “chauvinistic”, PP Mac received a letter from the Soroptimist International of the Americans, Inc. and as a result of PP Mac’s reply that organization contacted Ann Marie Roth of Merrill-Lynch and a Soroptimist Club was formed on the Island. That this administration was a extremely active one, is perhaps best illustrated by reproducing the 9 February 1978 issue of the “Guam Typhooner” covering the coming events for that week. Feb. 13. 1355 Governor Kiyose together with Rtns. Takayama and Asano will arrive from Tokyo PA Flight 803. Rotarians are encouraged to greet the Governor’s party at the airport. Evening open. Governor Kiyose requested that nothing official be scheduled. Feb. 14. 0200 Group 5 fellowship delegation arrives JAL. This group consists of 15 to 18 Rotarians and 5 Rotary Anns. Nine groups will be represented by the presidents and secretaries. The Primary function for this visit is to create goodwill and fellowship between Group II and Group 5. 900-1330 Governor’s official visit to Rotary Club of Tumon Bay. 1500 1500 Governor and party depart for Saipan by courtesy of Rtn. Past Pres. Brandy on Flight 1A-404. 16:30-2030 Official visit to Rotary Club of Saipan by Governor’s party, followed by 10th Anniversary banquet, Invited guests from Guam clubs will also attend the banquet. Afternoon Group 5 members will make an island tour, which has been coordinated by Group II Representative Rtn. Jimmy Shintaku. Group 5 has advised that they would like to help the Group II clubs, and as this is a fellowship visit, they would like to get together and meet with various Rotarians on this tour, as it is possible they will volunteer to help financially or otherwise with some of the Group II projects. 11:00-15:30 Governor’s official visit to Rotary Club of Northern Guam.Governor-nominee Aoki and his Secretary Tomaru arrives on Guam.Group 5 and Group II fellowship golf tournament coordinated by Past Pres. 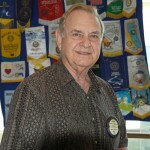 Bud Theisen, Chairman, and Past Pres. Jerry Perry, Co-chairman. Transportation to the golf course and other arrangements will be made by this committee. 1900 Not host buffet fellowship banquet at Dai Ichi Hotel for Group II and Group 5 clubs, including Rotary Anns. The Governor’s cup and other prizes for the golf tournament will be presented at this dinner and there will be an exchange of banners between the 9 visiting clubs and each of the Group II clubs. The Group II clubs will also present one of their banners to Governor Kiyose. Past Presidents Brandy and Jerry Perry are co-chairmen for the transportation and other matters required to make this dinner a success. 1100-1200 Group 5 members depart (schedule unknown).Official visit of Governor with Rotary Club of Guam. Meeting with president and secretary. 1200-1330 Governor attends regular club meeting. 1330-1530 Club assembly of all club officers, directors and committee chairmen for the purpose of conferring on the program and activities of the club. All members are urged to attend. 1500-1700 Guam Dai-Ichi Hotel – Training meeting for incoming presidents. Training Leader: Pres. R. Bowers. 1700-1800 Group meeting for incoming president, secretaries, and officers. Present officers and committee chairmen as well as new Rotarians requested to attend. Group Meeting Leader: Rtn. John Hoffman. 1930 Stag Dinner at Okura Hotel. Arrangement for this dinner are being coordinated through Past Pres. John Hoffman. Feb. 17 1000 Courtes Y call on Governor Bordallo by Governor Kiyose and Governor-nominee Aoki. 1530 Governor and Governor-Nominee and parties depart for Tokyo on JAL Flight 948. This schedule has been coordinated with the Rotary Club of Saipan; however, at this time the only feedback is that incoming President Igotol will attend the training meeting for incoming presidents and the stag dinner at the Okura Hotel. All Rotarians particularly committee chairmen should make every effort to attend the club assembly on February 16. It is essential that club officers attend to present their programs. Within the club, a number of programs are planned. In the area of vocational service, a monthly Rotarian employee recognition program has been established under the chairmanship of Carl Peterson. In addition, in cooperation with the Guam Occupational Information Coordinating committee, the club will participate in a speaker’s pool. Under the chairmanship of Joe Bourland, the Scholarship Committee has been invested with a working budget of $1,500.00 Scholarships will be focused on secondary private school students. A $500.00 scholarship has been granted to St. John’s the Academy of Our Lady, and Father Duenas, for award to a student of their selection. Under the chairmanship of Rotarian Larry Kasperbauer, the sister club relationship shall be revitalized. This relationship has sadly suffered in recent years. During my remarks to the Karuizawa Rotary Club in June, I made a personal commitment to their membership that we wanted the sister club relationship to continue and florish. Under the chairmanship of Brandy Brandenberg, a man-of-the-month program has been established to recognize each month a person who has made a significant community contribution.